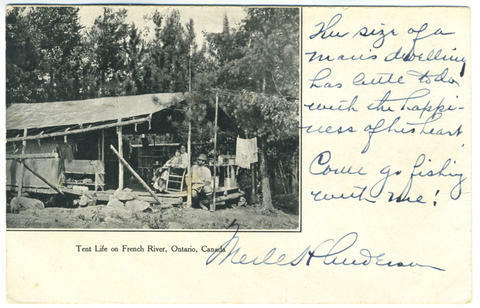 Item 032 - Tent Life on French River, Ontario, Canada. Card was cancelled North Bay, Ontario, J[une?] 29, year not visible. Card is addressed to: Mr. & Mrs. S. B. Carson. Morristown. New Jersey. U.S.A. Message on front right reads: The size of a man's dwelling has little to do with the happiness of his heart. Come go fishing with me! Merles Hudeau?